Holy moly, is it just me or does pumpkin spice everything taste amazing this year?! I’ve totally jumped on the Pumpkin Spice bandwagon, so get ready for lots of pumpkin spice and everything nice recipes, coming at ya! These scones are gluten free and are easily made paleo, just swap the buckwheat flour for all almond flour. I haven’t tested these beauties with coconut flour so that might be a trickier swap to make. These scones are packed with cinnamon, ginger, nutmeg, and allspice which are all incredibly warming and nourishing spices, perfect for Fall and Winter! Pumpkin is actually a really great food to add into your diet because its high in fibre, potassium and vitamin C. Vitamin C is amazing for immune system health and is a powerful antioxidant, fibre is crucial for keeping you regular and helping with your elimination pathways and potassium is an important mineral to keep our electrolytes and fluids balanced in our bodies. In a medium-large mixing bowl, sift together your flours, baking powder, salt and spices. Whisk everything to combine. Add in your butter, using two knives or a pastry cutter, cut your butter into your dry ingredients until you butter and flour mixture, forms pea-like crumbs. You can also do this in a food processor, add in your dry ingredients and butter and pulse 3-5 times until you form a pea-like consistency. Then transfer your dough back to your mixing bowl. Add in your pumpkin and maple syrup. Mix everything to combine. Place your dough on your parchment paper lined baking sheet. Either using your hands or a rolling pin, roll you dough out until its about 1 inch thick. This dough doesn’t rise very much, so you don’t want to roll your scone dough too thin. Using a sharp knife, cut your scones into 8 to 10 triangles and move them apart form each other on the baking sheet. Bake at 375ºF for 40-45 minutes, or until golden and cooked through. While your scones are baking, prepare your glaze. In a bowl, combine all of the ingredients. 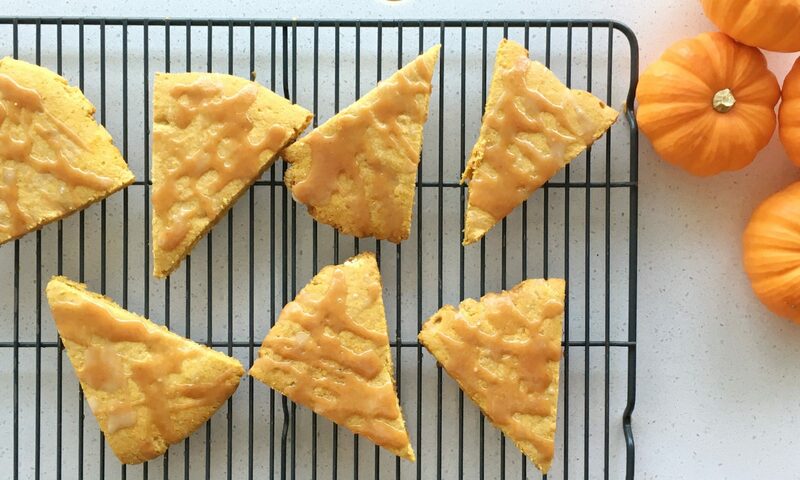 When your scones are cooled completely, drizzle your pumpkin spice glaze on the tops of them. Let the glaze dry and enjoy!